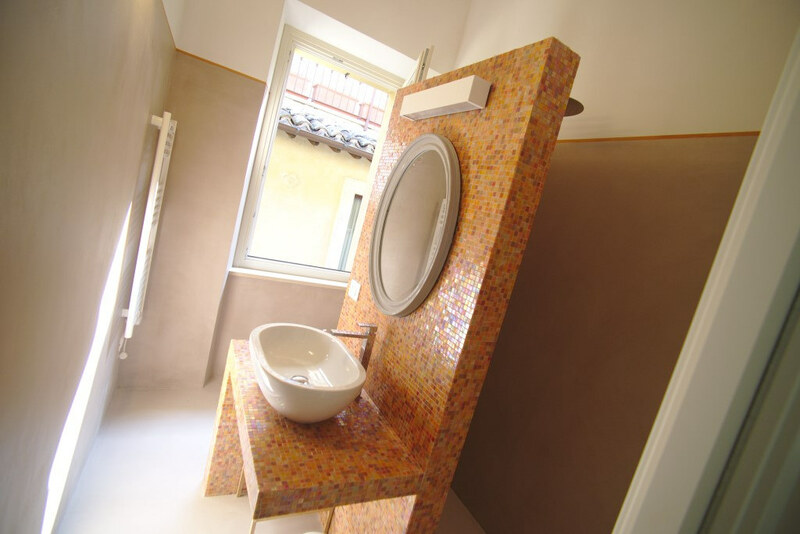 Use the form below to contact accommodation Design penthouse in the heart of Ascoli Piceno directly. 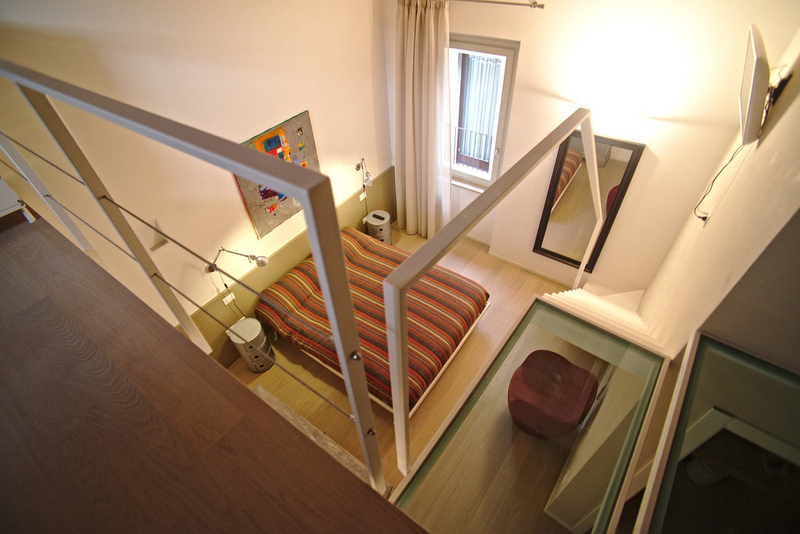 The Chiostro apartment has a living room with kitchen, a double room ( twin beds ) and in lounge there is a Sofa bed. The apartment has a bathroom with tub and shower and a laudry room with washer dryer and drying room. This moder apartment is modernised with parquet flooring and resin, the best heating and cooling floor and a thermal and acoustic insulation in accordance with current regulations. 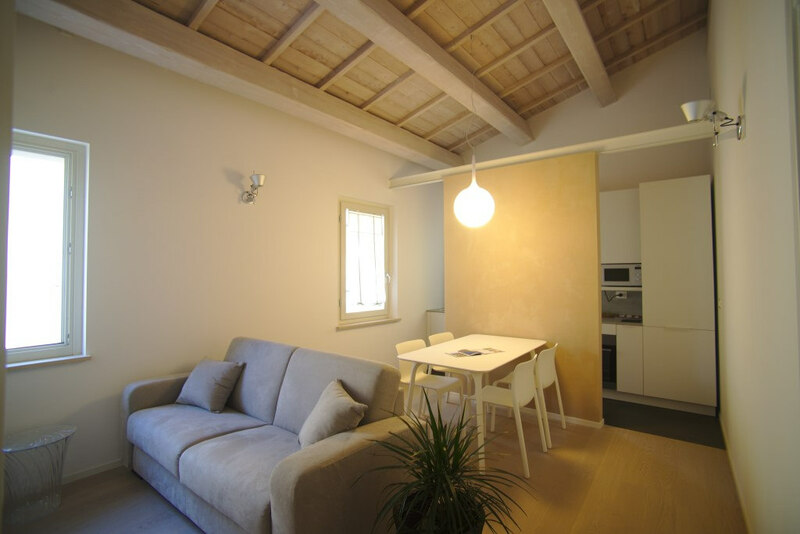 La Piazza apartment has a living room with kitchen, a mezzanine with sitting area and balcony . A room with double bed, a bedroom with double bed / 2 single beds ( twin beds ) and a bedroom with a single bed. The apartment has two bathrooms: one with tub and shower and one with shower. The apartment is equipped a laudry room and a terrace on the roof. This moder apartment is modernised with parquet flooring and resin, the best heating and cooling floor and a thermal and acoustic insulation in accordance with current regulations. 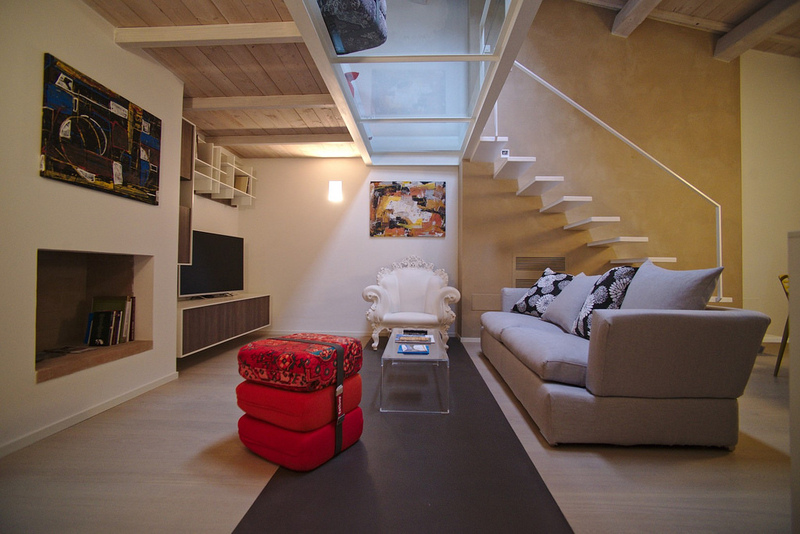 Penthouse is located in the historic center of Ascoli Piceno, a few steps from the splendid \\\\\\\\\\\\\\\”Piazza del Popolo\\\\\\\\\\\\\\\”, in an ancient palace completely restored in 2014 . It consists of two adjacent apartments, located on the second floor, accessible by elevator to the floor, with beams and roof beams, light and spacious. The apartments in the new structure and furnishings have been designed to ensure maximum comfort with taste, elegance and style, in a modern Italian style furniture. An idillic accommodation to spend days of relaxation between art and gastronomy, or to explore the nearby natural landscapes and sea mountain, both about a 30-minute drive from the city center. 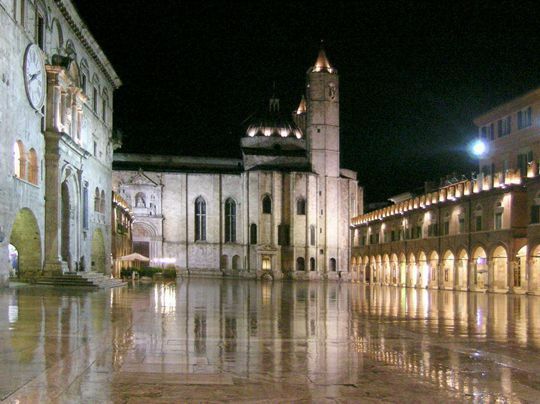 Ascoli Piceno is the largest city of Southern Marches with a population of about 60,000 people. Its historic center can be easily explored on foot and is built almost entirely of travertine marble, a gray stone extracted from the surrounding mountains. The Piazza del Popolo is the main city square, entirely paved with travertine, is one of the most beautiful squares in Italy. 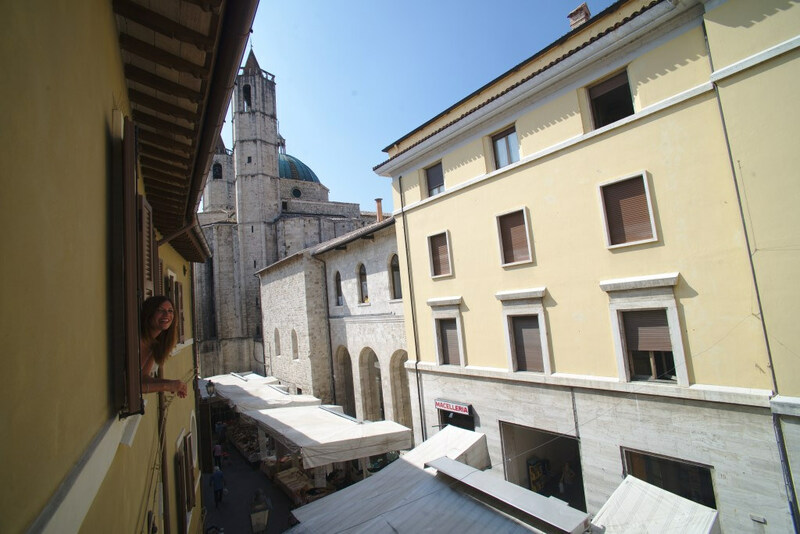 On the square there is the storical Bar Meletti, the Palazzo del Popolo and the Church of San Francesco. The other main city square is Piazza Arringo, where overlooks the Cathedral where you can admire the painting of the Madonna and Saints by Carlo Crivelli, and the Town Hall with the Art Gallery which houses a collection of minor and great works of minor artists. The city celebrates its medieval origins with a historical commemoration called La Quintana. Iit is a jousting tournament that takes place every year in the main square of the city on the first Sunday of August. The event includes a procession of about 1,400 people in medieval costume parade through the center of the city. A festival that is worth seeing. 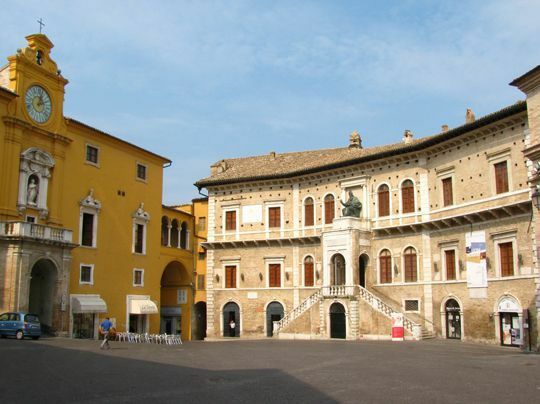 Fermo is one of the fifth province of the Marches. The city is located on the top of the hill Sàbulo to 319 meters high and its origins are previous to Roman times. The historic city is built around the Piazza del Popolo, the heart of the city. Around the square there are important historical buildings such as the Palazzo dei Priori, home of the Civic Art Gallery (Pinacoteca Civica) containing the art collection of the city. The most important work is the “Nativity” of Rubens 1608 and the Hall of the Globe (Sala del Mappamondo) containing a huge world map drawn by the cartographer Moroncelli Fabriano in 1713. Another interesting building is the Palazzo degli Studi town library “Spezioli”. To visit also the historic Teatro dell’Aquila, one of the most important theaters of the eighteenth century .the capital city of the fifth province of the Marches . Worthy of note are the Roman Cisterns (also called Roman pools), the most important evidence of its Roman origin. The underground construction work of the Augustan age (40 AD) of about 2000 square meters divided in 30 underground chambers on three parallel rows and beautifully preserved were built to collect and purify water in the city. Above the main square, climbing on top of the hill Girfalco you can admire the Cathedral of Fermo, the cathedral with its splendid Romanesque-Gothic façade of 1227.